Faith Franklin is a dreamer. She dreams of cakes & pies. She dreams of crepes & brownies. And, more than anything, she dreams of making a career of serving her delicious treats to an adoring public. So, when her grandmother calls and asks her to move to Florida to help run her café, she cannot get out of Minnesota fast enough! And before she knows it she is standing in Paradise Point, the beautiful, oceanside plaza in which Bessie’s Café is located, hardly able to believe her good fortune. Life is now exactly how Faith had imagined it could be. She’s made wonderful friends. The café, now renamed the Slice of Paradise, has been renovated to showcase her amazing desserts. And both locals & tourists are loving it! The owner of a nearby cupcake shop is not at all happy with Faith’s arrival in Paradise Point. She has accused Faith of trying to ruin her by stealing her recipes & designs. And she is not shy about letting everyone know it. Is Faith guilty of murder? If not, who is? And can Faith find a way to clear her name before her dreams turn into nightmares? 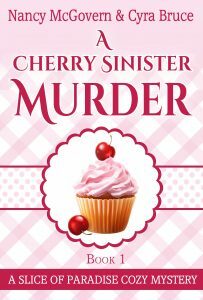 Find out in A Cherry Sinister Murder! I co-authored this series with a good friend in the UK, Cyra Bruce, simply because we wanted to do a project together. While it has been much more challenging than expected to write with someone who lives overseas, it has also been amazingly fun & fulfilling! Hence, we are now working on our fifth book in the series! Cyra & I developed our characters together by tossing out a basic idea and then handing it back and forth, each of us adding or subtracting something every time it came back our way. While it may have taken a bit longer than I could've done on my own, I believe it led to much deeper character development and a better story overall.